The video was tweeted by official Twitter handle of ITBP. New Delhi: Braving the cold weather, Indo-Tibetan Border Police (ITBP) celebrated Republic Day will full zeal and enthusiasm in Ladakh. The brave personnel hoisted the national flag at 18,000 feet and -30 degree Celsius. The video was tweeted by official Twitter handle of ITBP. 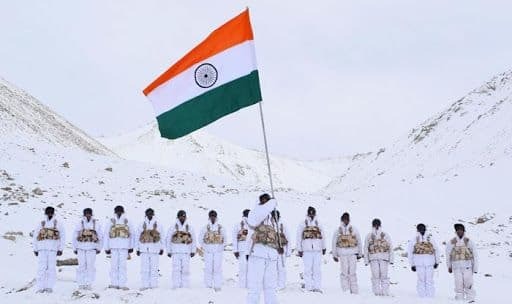 In the video, soldiers were seen marching on the snow-clad Himalayas with the national flag in their hand. In the national capital, the Republic Day 2019 parade at Rajpath witnessed the spectacular display of the country’s military-rich cultural diversity. South African President Cyril Ramaphosa was the chief guest for this year Republic Day. Many political leaders were among those present at the event. For the first time, four Indian National Army (INA) veterans participated in the parade. Lieutenant Bhavana Kasturi, Contingent commander, Army Service Corps also became the first woman to lead all men army contingent at the parade. At least 26 children who won the Pradhan Mantri Rashtriya Bal Puraskar also took part in the parade. The culmination of the parade was marked by a lone Su-30 MKI flying at a speed of 900 km/hr splitting the sky with a ‘Vertical Charlie’ maneuver over the saluting dais.